Of course, now that I've actually completed one (1) passage, I am officially an expert on the subject. This is the Toast Way. With all the confidence of a thirty year veteran, I feel qualified now to tell all you dreamers precisely what to do. I restrain myself not out of a sense of experiential deficiency but merely because the subject is so thoroughly covered in the cruising literature by such luminaries as the Pardeys and -- my personal favorite -- Bob Bitchin'. Instead, I would like to offer some suggestions for the complete passage n00b. This would be the bedazzled sucker who believes her father in law and husband that Neah Bay to San Francisco is not particularly long or challenging during the pleasant months of August and September and who is deluded into believing that both her body and her boat are ready for "big water." I will try to limit myself to only those suggestions that I completely failed to see in my extensive review of the cruising books. If these notes were in there, I must have slept through that day of class. Contents May Shift During Flight - No matter how tightly packed, no matter how well prepared, everything in your lockers will be both shaken and stirred. Inevitably, something will maneuver itself to the front of the locker only to emerge with a shout of glee and a shatter of glass on opening. Sometimes it is the kitten. More frequently it is something that either (1) can not be easily replaced, (2) requires a vacuum to clean up, or (3) exudes a rank smell that makes everyone want to vomit. Bring lots of rags and the patience of Job, and be careful opening doors. Everything that Worked, Breaks - We left with a short list of Things Not Yet Fixed (patent pending). We arrived with an extraordinarily long list of stuff that didn't survive the beating. Apparently all the southeasterlies off Vancouver were insufficiently destructive to break our gear conveniently before we left Seattle. So now we have about two hundred things to do in San Francisco. A full passage plan includes weeks at your destination to put the boat back together. Better Living Through Chemistry - One of our crew arrived with acupuncture dots to help with nausea. The sea jeered him and roundly smacked him upside the head with a 24 hour bout of the nastiest sea sickness I've seen in a long time. Dry heaves are horrid. Don't go there. There are nasty drugs now that you can take to poison your system utterly in a valiant effort to battle off the queasies on the theory if you are sufficiently dead, you can't vomit. Just take them. Trust me. Ultimately, we had to put him on prochlorperazine. The rest of us -- and Jason after we got him back on his feet -- took meclizine 25 mg twice a day. The later is an anti-emetic that does not cause drowsiness. After a few days at sea, we all were able to taper off and by the fourth day we were even reading books. General Foods International Coffees - I hate these usually. They are too sweet and a poor excuse for coffee. However, on watch it is a blessing to just heat a pot of water and let your crew help themselves. Lay out a tray with instant coffee, teas (mint, green and black), and instant soup. The biggest problem in feeding my crew was keeping them hydrated as they tended to drink too little. I did everything I could to tempt them to drink more. Do Not Bring the Cat - Dulcinea had the time of her life. She loves boat life. The problem is that she LOVES boat life. She is all over this damn boat all the time. Being a cat, she is always in precisely where you want to step. 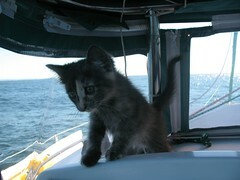 She wants to go on deck in 40 knots winds to play with the whipping straps on the bimini covers. She wants to play on your face in the middle of your off watch. It's like going through finals week in college with an asshat 14 year old child prodigy armed with a brand new Wii and a crush on you. I should have made the grandparents deal with the kitten. 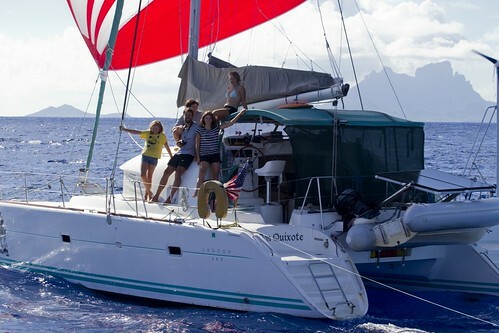 Even Catamarans Rock and Roll - Catamaran motion is called -- sometimes pejoratively, sometimes fondly -- a rocking horse motion. This description is particularly apt during the long haul. While there is no leaning, there is still considerable motion as you sit, drive, contemplate your navel, or attempt to sleep. While catamaran owners do not need to invest in lee clothes, I do recommend a bunch of extra blankets, pillows or bolsters. Place these around your body as you sleep, and your fat will jiggle considerably less. This assumes you are not using the passage to jiggle your fat off, though, a widely proven weight loss technique. iPod, Accept No Substitute - Seriously. Stop screwing around with competitor products or your radio or, god forbid, CDs. Just invest in an iPod for each crew member. Fill it with music, audio books, and podcasts. Make sure your stereo system has an iPod-in capacity. Make it a Writ From Captain that crew on helm make ALL decisions about what to play, method of delivery (personal ear buds or system stereo), and how loud to play it (within reason). Let me close these notes with a short list of things you do not need to bring for your passage: books, video games, spicy foods, alcoholic beverages, board games, needlework, carpentry projects, movies, makeup, condoms, or hiking shoes. Glad to hear you survived. I remember my first offshore passage from Miami to Charleston, SC in late November (having never sailed a cat at the time, at yes, I was a naive and eager little 25 year old!) I was SO FREAKING SICK that I started to hallucinate that there was a man named Pedro living in our dinghy and I would talk with him during the night watch. I miss Pedro. Ok, no I don't. Ten years and many miles later I can say it really does get better. The highs and REALLY high and the lows are REALLY low. Don't get swallowed up by the extremes. Have you guys tried seabands? I'm curious if they work. They did wonders for my morning sickness and hell they are quite fashionable. I second the Ipod - invaluable - The only thing that helped my seasickness was laying flat on my back with my Ipod buds snuggly fit into my ears while I happily munched on saltines! Bravo on a safe passage!! This is going to sound really disgusting, but beef jerky cures my sea sickness. It can't be Slim Jims or anything greasy...just nice, dry jerky and I am good to go. Oh, and if you use a scopolamine patch, never ever cut it in half. You will be sicker than hell and you will be chatting with Boatbaby's friend Pedro. Great advice all the way. We just completed the first half of your Neah Bay to SF passage. 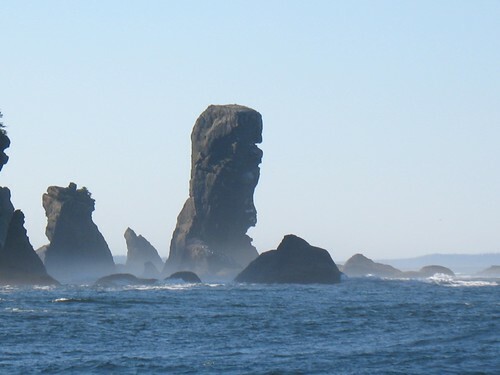 We were only going to Winchester Bay, OR. We found that wrapping our glassware in old (preferably clean) socks prevented any breakage on the way, but then, our seas were probably quite a bit more settled than yours also. We even arrived with a Coast Guard greeting party at our dock on arrival! Well, ok, not a greeting party - a boarding party. Very courteous and brief.